Important! Rename the file to .zip after you download it and extract. WinCustomize will only accept wba's in this category, but the file includes 2 sets of toolbar icons. Included in the zip are the regular toolbar icons for w0rse plus a recolored version that could go with a larger number of skins. Wow! 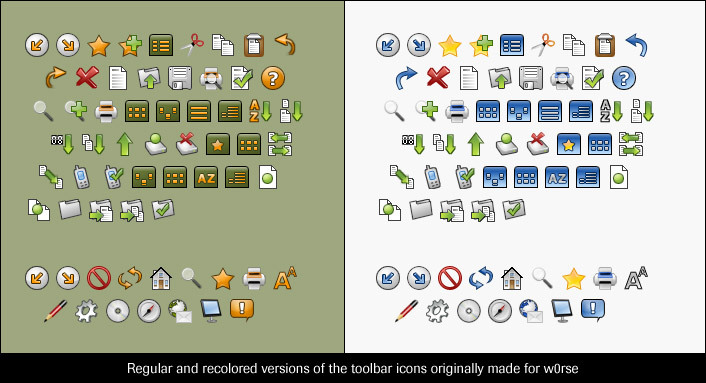 Some of the coolest looking toolbar icons I've seen in a long time. I'm still using w0rse on my computer. These icons are just great. I would second neophil78 in his call for a bootskin to match (please). I'd be in heaven if there was a matching sysmetrix with music controls and weather, or a weather widget / winamp skin combo. Any plans for any of those? wOrse icon toolbar I've ever seen! However, I do believe a bootskin would remedy any compliants I may have in the future. Oh, good bar. Both of them.